The Private Placement is subject to, among other things, the execution of a definitive investment agreement, approval of the TSX Venture Exchange, and approval by the Company's shareholders at a meeting expected to be held in March 2012. The Company will pay a finder's fee of 5% in cash to an arms-length Turkish-based party. Mario Caron , CEO of Aldridge commented, "Aldridge is excited to obtain both the funding and a strategic Turkish partner. The Private Placement ensures the Company will have the resources to complete the Yenipazar feasibility study in 2012. ANT's management team has the government, banking and vendor relationships required for efficient project development in Turkey. Obtaining funding at a significant premium above the market price in tight capital markets is a testament to the quality of the Yenipazar project and the capabilities of Aldridge's management team and exploration prospects." Fatih Berk , CEO of ANT added, "The Yenipazar project has great potential to quickly become a significant mining operation contributing to the economic development of Turkey. The size and terms of our investment are clear indications of our commitment to work with Aldridge's management and Board to develop and enhance the Company's valuable mining properties." Aldridge is a publicly-traded junior exploration company focussed on advancing its flagship Yenipazar polymetallic VMS deposit (Au, Ag, Cu, Pb, Zn) in Turkey with a feasibility study, which is building on its December 2010 Technical Report and Preliminary Economic Assessment. The feasibility study is expected to be completed by the end of 2012. 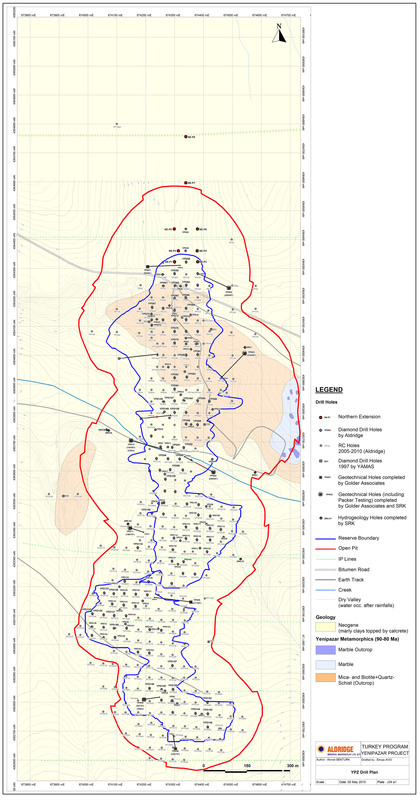 The Yenipazar deposit is subject to an earn-in agreement with Alacer Gold Corp., wherein Aldridge can earn a 100% working interest subject to certain conditions, subject to a 6% net profit interest ("NPI", revenues less operational costs) until revenues of US$165 million are generated, and a 10% NPI from there on. Aldridge's other activities include identifying and developing additional mineral properties in Turkey and Papua New Guinea ("PNG"). Aldridge's PNG exploration license includes an area of approximately 338 square kilometres known as the Kili Teke license. The license area is prospective for gold, silver and copper. ANT was founded by Ahmet Taçyildiz in 2005 and is one of the leading companies in Turkey. The ANT group of companies currently operate in Finance, Energy, Services and, Commodities and International Trading. The company has a strategic focus on growth and expansion in the coming years. This news release includes certain forward-looking statements within the meaning of Canadian securities laws. Forward-looking statements involve risks, uncertainties and other factors that could cause actual results, performance, prospects and opportunities to differ materially from those expressed in such forward-looking statements. Forward-looking statements in this news release, include, but are not limited to, economic performance and future plans and objectives of the Company. Any number of important factors could cause actual results to differ materially from these forward-looking statements as well as future results. Although Aldridge believes that the assumptions and factors used in making the forward-looking statements are reasonable, undue reliance should not be placed on these statements, which only apply as of the date of this new release, and no assurance can be given that such events will occur in the disclosed timeframes or at all. Aldridge disclaims any intention or obligation to update or revise any forward-looking statement, whether as a result of new information, future events or otherwise.